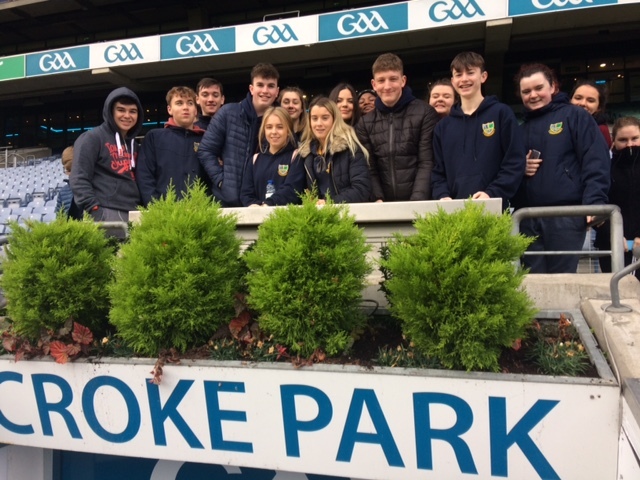 St Paul’s TY1 group recent went on a trip to Croke Park and the day simply wouldn’t be complete without them experiencing the treasured GAA Museum. They totally immersed themselves in the spine-tingling and completely unique story of Gaelic games from ancient times to the present day. This museum is like no other sporting museum the TYs ever visited. It not only celebrates the history of Ireland’s national games, it also vividly brought to life how the GAA has contributed to our cultural, social and sporting heritage. The Tys on their guided tour visited exhibitions which included the original Sam Maguire and Liam MacCarthy Cups, the Hall of Fame, and they especially enjoyed a whole floor dedicated to the games as they are today. When they were done exploring, they got a taste of the action in the popular Interactive Games Zone, where they tested their hurling and Gaelic football skills. They even ran into the GAA President Aogán Ó Fearghaíl, who held the door open for some of the students!